"Derby College gave me the confidence to do what I’m doing now, and I owe my lecturers a lot." Work experience offered through Derby College’s links with Bespoke Inns has led to the ideal job for former hospitality student Jack Bowler. Jack, who got a distinction in his foundation degree course in International Hospitality Management, has been working at the Boot Inn in Repton, a Bespoke Inns’ traditional pub and restaurant, since August. 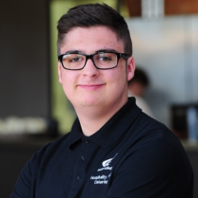 Although he already had catering qualifications from Derby College, Jack was keen to learn the front of house side of hotel and catering. The Academy seeks to bridge the gap between education and the workplace for the College’s hospitality students so that they can put into practice their customer service skills at top quality establishments. He especially likes working behind the bar and telling customers about the range of beers brewed by The Boot’s microbrewery next door. He said: “My foundation degree was brilliant and the professional development offered through Bespoke Inns is unbelievable.